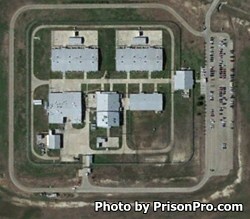 Woodman State Jail, sometimes referred to as Woodman Unit, is a minimum security facility that houses female offenders located in Gatesville Texas, part of Coryell County. The facility was established in 1997 and is situated on 15 acres of land. Additionally, Woodman Unit is co-located with three other units; Crain, Murray, and Hilltop on 1,283 acres. Woodman State Jail has a maximum capacity of 909 female offenders who can be classified as J1, J2, J4, G1, G2 or Transient. Woodman State Jail serves as an intake and diagnostic facility for most of the female offenders from surrounding areas. Woodman Unit is also responsible for the screening and assessment of substance abuse offenders. Woodman Unit contains two 400 bed housing units known as J and H. Both J and H are divided further into eight 50 bed dormitories. The facility is secured by a fence with razor wire, constant armed perimeter patrol and electronic detection systems. Inmates at Woodman Unit are provided adult basic education and literacy courses, and can earn their GED during their incarceration. Additional programs provide inmates with parenting classes, life skills, victim awareness, cognitive intervention and help prepare an inmate for an upcoming release through the CHANGES pre-release program. Vocational training provided at Woodman Unit includes electrical trade, painting, and business computer information systems. Some inmates are selected to provide a supervised labor force to local city agencies, the Texas Department of Parks and Wildlife, and the Habitat for Humanity. Offenders who are incarcerated at Woodman State Jail have visitation on Saturdays and Sundays from 8am to 5pm. Inmates are allowed a single visit each weekend that can be a maximum of two hours (special visits are four hours in duration and may only be granted by the Warden's Office to visitors who live over 300 miles away). Visiting ends at 5pm for everyone, regardless of the time you entered into visitation, so if you arrive at the facility anytime after 3pm you will not have a full two hour visit. Woodman State Jail allows visitors to bring up to twenty dollars in quarters contained in a clear Ziploc bag to use in the vending machines.